Looking for a list of the best Disneyland Toddler Friendly Rides? Going to the Happiest Place on Earth with your toddler? I used to think that a child should be 5 or older to actually enjoy going to Disneyland. But after a mostly un-planned last minute trip to Anaheim with our 2-year-old last month I learned that young toddlers can also have a great time at Disneyland. We had an amazing three days at Disneyland and Disney’s California Adventure Park with our son. If you have the chance to go, but you are unsure about taking your toddler, you should definitively go for it (kids under 3 don’t pay for entrance and eat free). There are tons of things to do for the entire family, and even if they don’t remember everything, you will still have some amazing memories and photos to share with them later. We ended up going during off-peak season, and that meant we avoided crowds and long line-ups. It was perfect because we had a max of 5-10 minutes wait for popular rides and we walked-in most rides right away without any wait. It also meant that we could go on rides that we loved again and again without even getting out of the ride to get in line again. Toddlers are not known for their patience and going to Disneyland during the off-peak season means you don’t have to worry about long waits before going on rides. If you can, I recommend visiting Disneyland during their lowest attendance times: January (except New Year’s Day) until just before Presidents’ week in February, the week following Labor Day until just before Thanksgiving week or the week following Thanksgiving until the week prior to Christmas. Try to plan your visit for weekdays too. We were there on a Thursday and Friday, and it was wonderful, no crowds and no waits. The weekend was way busier, especially in the afternoons. Your toddler will get tired of walking right after you walk pass the main gates. You will be walking long distances all day, and you need a good stroller that’s comfortable for your little one. You can always rent a stroller at the park for $15 per day if you decide not to bring your own. Before you line-up for rides you must park your stroller outside the rides in a designated area, so make sure to bring something you can put on your stroller to help you identify it easily. I used an old scarf that was colourful and easy to spot. Because you can’t run to the washroom to wash their/your hands after each ride and when you get on rides you and your children will be touching handles, seats and everything else. Especially important during flu season! You want to have healthy snacks on hand for your child. You don’t want a hungry/thirsty cranky toddler all morning! You can always purchase snacks inside the park but be prepared to pay a lot for them. We had lunch at Disneyland during the three days, and I wasn’t really impressed with the food. The meals were expensive and the food wasn’t really good. I heard people saying that restaurants at Downtown Disney were a lot better than the restaurants inside the park. Something else to try! 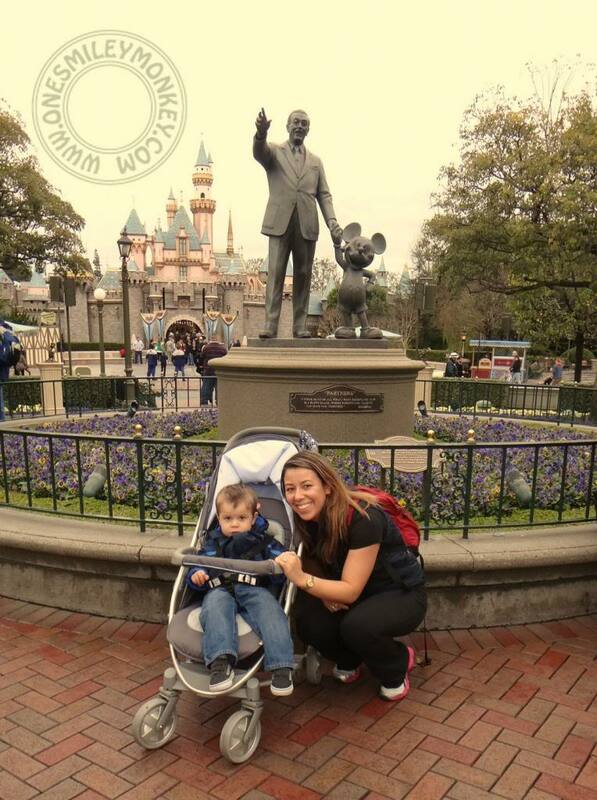 If you go to Disneyland during the rainy months, then don’t forget to pack a raincoat and stroller rain cover. If you are going during the warmer months then take sunglasses, sunscreen and always wear layers for sudden temperature changes. Note: Remember to use sunscreen protection even during an overcast sky and when it’s not sunny outside. I took our smaller camera because I didn’t want to carry my big DSLR all day and get in the rides with it. You can get wet when you go on some rides so you shouldn’t have your expensive camera out just in case. Bring a battery replacement because you will take tons of photos and your battery will run out at some point. If your feet get wet during a ride you can easily change socks, bring an extra pair for you and your child. You will be walking a lot, so you want to be comfortable, don’t wear heels! I saw a woman wearing heels as we were entering Disneyland and I have no idea what she was thinking. I hope she brought some comfy shoes to change into later. I mean you already carry all of that if your toddler isn’t potty trained anyway, right? Just make sure to pack a few extra diapers if you are planning to stay at Disneyland all day. Disneyland also has a baby center that includes facilities for diaper changing, nursing and bottle feeding. They also sell diapers, wipes, baby food in case you forget to bring them or need extras. When you arrive at Disneyland head to Fantasyland first, Fantasyland has the big castle as well as several gentle rides themed after Disney movies. Many of our Disneyland Toddler Friendly Rides are there. -Pinocchio’s Daring Journey, Snow White’s Scary Adventures and Mr. Toad’s Wild Ride have dark, loud sounds and sudden movements that can scare younger children. My 2-year-old was o.k. in those rides, but I think he was a bit shocked with the loud noises and sudden scary sounds. I recommend avoiding these if you have a young toddler. “It’s Tough to be a Bug!” is a 3D show about bugs and it is definitively scary for young toddlers. Realistic spiders and insects jump “out” of the screen, and it’s loud and dark. * Note that each child is different. The lists feature the rides that our 2-year-old really enjoyed. As a parent, you will know what your child will like and what they would find scary. Use your own judgment before getting on a ride. 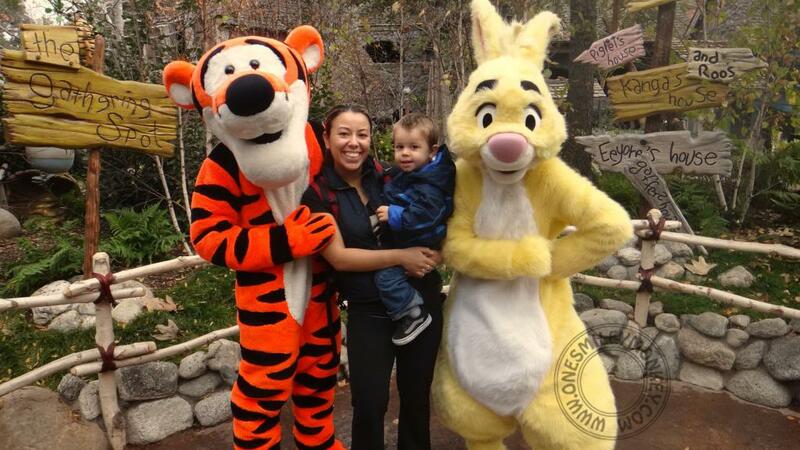 Familiarize your toddler with all of Disney’s characters before your trip. There will be characters walking around the park and photos with them are always great. Note that there may be long line-ups and the characters have a very strict schedule for breaks. They can and will go on a break even if you are the next person in line. Be prepared for disappointment and more waiting after waiting for a while, especially during busy season. Arrive early at opening time but allow 5-10 minutes after opening to miss the big rush. No big line-ups at the gate then. Don’t feel rushed to do everything. Take your time and enjoy! Remember you are at The Happiest Place on Earth after all! Don’t force your child to get on a ride or take photos with characters when they don’t want to. Avoid temper tantrums and try again later. Grab a map at the gates, so you know where you are going. Try to plan your day and know the heigh requirements of the rides you are planning to go on. Familiarize yourself with the FastPass system and use it! Don’t wait in line if you don’t have to. Ready to purchase your Disneyland tickets? Use Park Savers to save over gate pricing! There are always many wonderful new things to learn when you go on a holiday with your little one. Disneyland is truly magical, and your toddler will love it there. If you have been to Disneyland with your toddler, what were your favorite rides or things to do/see there? Note: Check out our latest post from our Jan 2016 visit to Disneyland with TWO kids, a toddler and a kindergartener. Some great tips on getting the most out of your visit with younger kids! HERE. Disclosure: This is NOT a sponsored post. I just wanted to share our experiences at Disneyland and Disney’s California Adventures Park with my readers. Winnie the Pooh: Yummy Honey-Loving Recipes! For all the money one spends, I think it would be better to wait until a child is at least old enough to remember the experience. Joyce, some people have toddlers and older siblings and they want to go together at the same time. Also, if you happen to be close to Disneyland or in Anaheim for some reason (like it happened with us) there is no reason not to take your toddler. Toddlers under 3 enter free and eat free. Eat free? Really what places would those be, just any restaurant or buffet style? My husband and I are about to take our 14 month old. Will she remember it? No. But WE will. We love Disneyland and went many times together before having a baby. We live in Northern California so it requires a little travel. But since our daughter will be free, it’s no different, cost-wise, than it was before we had her. And watching her discover all these new sights, sounds, people, and adventures will be magical for us, and expand her experience in the world. What’s so bad about that? Granted, if this is a trip solely for your kids, and/or something you may only be able to do a couple of times in their childhood, then certainly hold off. But we intend to make this at least an annual trip. So it hardly feels like a waste. Besides, I find it so silly that some people would judge others for taking their children to Disneyland at an age they deem “too young”. Who cares? Live and let live! We live in Los Angeles and have a yearly pass. We have been taking our daughter to Disneyland since she was almost 2 and she loves it. I think it is a great age and there are many things to do for toddlers. She loves Dumbo the Flying Elephant and the Nemo Submarine Adventure rides. I would bring one of those harnesses, its like a backpackbto them but they are more or less on a leash so they can walk but not too far. Disneyland is great for all ages, including toddlers. We have a 2 1/2 year old, 4 year old and 6 year old and they all enjoyed it when we went last year. This was helpful. I had heard kids are free until 3 yrs old but was wondering if they would get anything out of it. Now I will definitely consider taking my daughter. Great tips! We are headed over at the end of the month. The first time in almost 10 months. Now that Noah is much more of a mover I know it will be harder to keep entertained during the long lines. Hopefully Wed-Fri will be a pretty slow time this month. Thanks for the list of rides! I’ll have to reference this guide if we decide to take my grandson this summer! Thanks for all the information.I won’t be going to Disneyland because I live a long ways off from there,but when I take my child to Dollywood in Tn. I don’t like to take him with the older ones,because of the rides.He can’t ride what they do,and they don’t like to wait while he rides his rides. We are planning a trip in the fall so our almost 5 year old can enjoy the magic of Disneyland while he still believes. I am grateful for all your tips as we are also bringing our almost 2 year old. We have grandparents coming also so I am not worried that everyone will have a great time. Wow..now this really makes me want to go! I’ve never been there before either…and now that our is 17 months old and walking like crazy I think he’ll have a blast! Thank you for this post! Thank you for the wonderful tips! I wouldn’t have considered that some of those rides might be scary for a toddler, keeping that in mind for our trip next month! What a fun experience! I wouldn’t have thought there would be enough to do for a child that young, so I’m pleasantly surprised. Glad that Disney is keeping younger siblings in mind as well. We have gone twice to Disney World (Florida) with kids under 5. The first time, my DD was 4.5 months old, and the second time, DD was 3.5 years, and DS was 4.5 months! It’s totally doable. My DD is tall for her age, so she could go on some of the “big girl” rides, and loved them. One of her favourites was Splash Mountain! I totally agree on utilizing the Fast Pass system, and keeping snacks at hand at ALL TIMES. If we were waiting in a line, and DD asked for food, I was glad to be able to whip out a variety of choices for her rather than have to leave the line or deal with a tantrum! Thanks for this! My daughter absolutely loves Cars! I hope to go soon someday. this will help me when taking my grand kids to disneyland this year.. thanks! This is such an awesome and useful post. My husband has never been to Disneyland and now that we have our daughter we’ll probably make it one of our vacations. That’s so awesome that children under 3 don’t pay admissions and eat free! I cannot wait one day to take my kids to Disney Park…these are great tips! Hi! Thanks for all the great info! Can you explain more about the kids under age 3 eating for free? Thanks! Hi Bea, kids under 3 eat free off your plate at all a la carte restaurants. At buffets they can eat free as well as family style dining meals. If you order them their own food at any restaurant then you do have to pay for it . I thought Disney was just always super busy, good to know about the off season. What a wonderland! I have been in love with Disney since I was a child. I am so sad that we were not able to take my son there as a child. But, if I am capable, I will take my grandkids (should I have any soon) or my little great-niece. I need a reason to go! It is so awesome! The tips are very good ~ everything to make the trip easier! Great pictures. Looks like you all had an unforgettable time in Disneyland. After our wedding, we are going to save up for a trip to Disneyland. I will keep these awesome tips in mind, thanks! Wow, looks like hours of family fun. 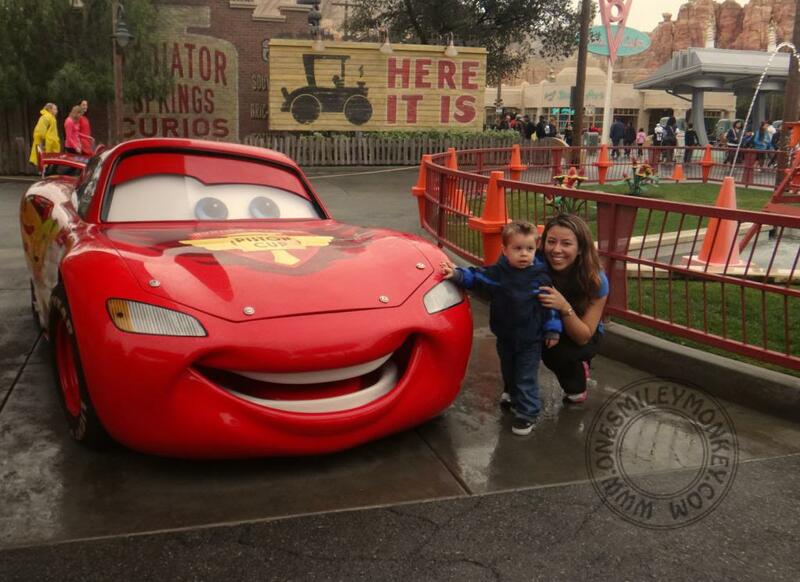 My son would love to go to Cars land, he would be in heaven, he loves Lighting McQueen. Saving up for a trip to Disneyland, we would all love it! THIS is the best piece of advice. While I have never been to Disneyland I have visited Disney World many times. Understandably many families are trying to fit everything in during their visit, but in their frenzy to do it all they lose the fun in the experience. As much as it pained me, on our first visit visit to Disney my then 4 year old spent her day dancing in front of the castle, watching the ducks, and alternately rode Dumbo and the carousel for hours. She loved it. We’ll be going to Disney in 2015 and by then the boys will be 5 and 2. One tip I would add is going back to the hotel room in the afternoon when the crowds are highest and it gets really hot out and take a nap or play in the pool. Then you’re all refreshed for an evening of fun. Thanks for the great tips! We are looking at going to Disney with our little guys and I have definitely going to keep your recommendations close at hand! I love Disneyland, its great for kids and adult kids lol! What a great thorough list of info for traveling to Disneyland! I will need to bookmark this post! Thanks so much for all the info. Awesome article! Looks like a fun trip.. We are headed there next year and while i don’t have toddlers anymore, my kids are a bit nervous since they haven’t been there. These are all great tips, you need a lot of stuff with you when you go to this type of place. Fantastic Tips! We went during the off season when our kids were little! It was soooooo much easier for us and there were really no lines at all! This is an incredible post! I am bookmarking it. We took the kids to WDW last year and thought my 3 year was a bit young. We are hoping to take the kids to disneyland in the next few years! Loved your post! Do you think that a 14 year old toddler would enjoy Disney California Adventure? We’re planning visit Disneyland and Disney California Adventures next month, but we’re worried if she would have things to do there for her age. What would you recommend? Thanks for the tips! Priscila, I have definitively heard about families taking infants/younger toddlers to Disneyland. A lot of the rides that I recommended for toddlers should be good for infants but again it is really your decision once you see the rides and if you feel comfortable for your child to go on the specific ride. One thing is that even the gentle rides can have moments when there are sudden moves or things get dark. If she is o.k. with that and you think that would not bother her then it should be fine. My son had a great time at 2-years but I still think that the best age to go if you can plan it is when they are older than 3. They can go on more rides and remember more. My friend is taking her 4 year old twins to Disneyland next year and having showed her your article she loved it. You gave her so many ideas and as you took your son and had an awesome time she feels more comfortable. They are going off season which will be better for the twins also. Love your posting, thanks for sharing. Thanks for letting me know Deb! Happy to hear that she loved it, they will have a blast I am sure! great tips! we’d love to go someday, but guessing we’ll go once our kids are a little older than toddlers. sounds like so much fun! Awesome post, we’re planning to go in october and hubby is still hessitant because Lyra is 2.5… thanks for the info! Thanks for sharing these amazing tips. We are in the planning of taking our son on a disneyland cruise and I know these tips will come in handy. Thank you for sharing. I’ll be taking my daughter to Disneyland in Nov. She’ll be turning 2 in Oct. It’s gonna be our first solo flying trip… But we’ll be meeting my brother at the airport and he’ll be taking us. We fly in on a Fri and will be going to Disneyland Sat and Sun and then fly home (to San Antonio, TX) on Monday… I showed him the list of rides you suggested and asked if we could most of them that weekend — He said we could do them ALL! I’m super excited! Thanks!!! Awesome! Have so much fun! Shared on our facebook page… I hope it’s find with you? Great reference, thank you. We took our two and three year old and were very surprised how well it went. From open until close they were all over it. A couple melt downs due to toy shops at the end of many rides. Go for it, pay attention to the tips listed and have fun. 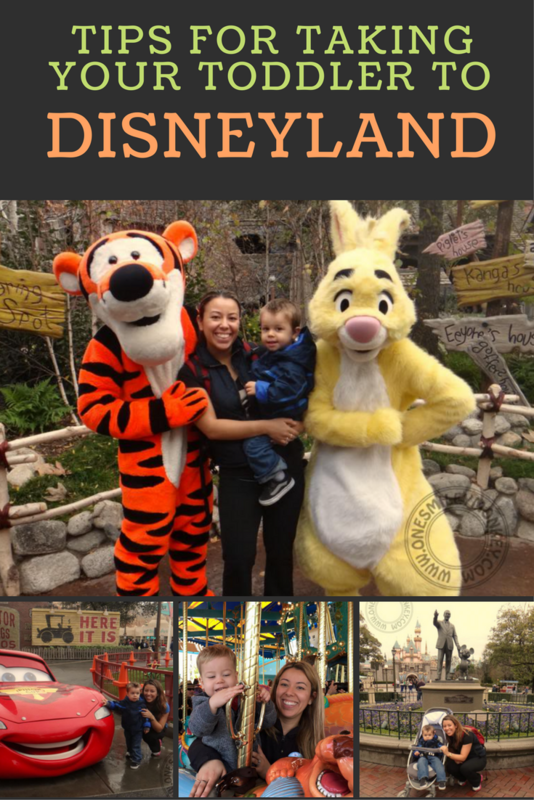 We are planning on taking our son to disneyland for Christmas time and these tips are perfect. We wanted to wait to take our son until he turned 5 years old so that he would possibly have some unforgettable great memories. We are taking all the advice that we can. Toddlers are quite different and sometime you don’t know what to expect. Thanks for sharing some great tools and advice. I plan to put them in effect. Hi! Did you stay at Disneyland hotel? Wondering if it’s worth the extra $$ to stay there with a toddler. Or if it would be fine to stay at The Embassy Suites close by. We stayed at the Hilton hotel that is about 5- 8 minutes away from Disneyland (by car – bus). There is a paid shuttle you can take from the hotel that takes you to the front gates of the parks. Some hotels even have free Disneyland shuttles, check those out. This is a great guide, not only for the toddler idea, but also as a set of great tips on what are some of the highlights of the park. It’s hard, maybe impossible, to see all of Disneyland in one day, but the attractions you mention here are so much fun. One day I would like to take my little one.. thanks for the info. Such great tips! I will be taking my daughter around her 3rd birthday with my 10 year old son. Hopefully won’t be too challenging now. I cant wait until my son is old enough to go!!! Those are some great tips!! We are taking our girl for her Bday #4 to disneyland. I will print all this to be aware of the attractions and just add what I already know I want to do with her. thanks so much for talking the time to write all this!!! Cheers!! This was a great list, thank you! Thank you so much for all the info!!!! I plan to go this summer with my son & nephew. They are very young, so I was nervous. Thank You for posting all this info!!!! Yay free food!!! This is a great article. Thank you for these tips. All of the Disneyland restrooms have changing tables, but I found the family restrooms are great to use as well. The family restrooms are large, so you can easily bring in your stroller. If you have multiple children, the family restrooms are great because you can lock the door and not have to worry about one child wandering off while you change the other. Thank you for the list of toddler rides! Looking forward to visiting Disneyland next week with my 2 year old, thanks to this post. This article is awesome. Thank you! I have one question that neither the article nor the comments address: Does it make any sense to get a “Park Hopper” pass (for both Disneyland and California Adventures in the same day) if you’re going with a toddler? My knee-jerk reaction is that it seems optimistic to think that you can do both parks in one day with a toddler. However, if people do it all the time, I wouldn’t want to miss out. Bob, it depends on when you are going, how long you are there for and your child. If you go during the busy season I recommend to give yourself at least one day to do each park, you will be waiting in line for a longer time and your toddler will probably be tired from all the waiting as well. We were there during slow season and we were able to do both parks the first day BUT we didn’t get to go on ALL the rides. We went back the next day and tried both parks again but we went in different rides. I liked knowing that I could go from one to the next in the same day but it really depends on your personal situation and preferences. I do have a question for you though, in the beginning of your post you state that kids under 3 eat free? I just was wondering if there is something special to buy to have that option?? My daughter will be about 16 months when we go and I’m trying to already decide what to do about food. So exciting! You will have a great time! The simplest way for them to eat free is at the buffet restaurants. At table service restaurants they are offered something of there own although just what that is depends on which restaurant you’re in which isn’t really helpful, you can order them something from the menu that you pay for if you like. They don’t eat free in counter service restaurants though. Wow what a great post with lots of useful tips. Thanks! Your post was very helpful. My son is turning 2 this Sunday and I cannot wait to take him to Disneyland this year. And because he is still too young to probably remember we will be sure to take lots of pictures. Great info and tips, makes me want to be a kid! If I went to disney, I would definitely do this. and I have you bookmarked to see new information on your site. Our son is going to be 5 in September and he’s already been to WDW 3 times! HA! We waiting until our oldest was 3 1/2 to take him but with our younger (partially because we had an older child dying to go back) we didn’t bother. Slower pace, allowing for naps is key and keeping realistic expectations affords everyone a good experience! Excited to be heading to Disney in Florida in April 2015. I wonder if the rides will be the same? Glad that you enjoyed yourself. Thanks for sharing. Thank you for the pro tips! This was great because I am sure it has changed so much since I have been many moons ago!! I have thought it would be best to take our LO when he is older, but there are a lot of good points to think about. Great tips! Personally, I’m going to wait to take my son until he’s a bit older. Vacations are few and far between for us because of work schedules and, of course, money is often tight. I figure we can all get the most out of the trip when he’s older. Thanks for all the great tips! We are taking the grandkids here next year so these will help!! I can’t wait to take my little man soon! Thanks for all the great tips! Oh hand sanitize is a must! I once forgot it and I felt gross the entire day! One day ill take my little one, such great tips. Just got back from a trip to Los Angeles with my 4 year old that I won and wanted to take him to Disneyland so badly but decided not to because of the measles outbreak. I did not want to take the risk. Took him to Universal Studios instead, which was part of the prize that I won and he had an absolutely great time anyway. Guess we’ll have to save Disneyland for the next time! It is a challenge taking a toddler but your tips were helpful. We took our daughter when she was 5. Disney brought out the best in her, and being prepared for spills, hunger and whatever else helped. We had a blast. wow. thanks for sharing. I so want to go again! Thanks so much! This is really helpful. We are heading to Disneyland in December with our 2 and a half year old and a 7 month old and wanted to know what rides would be the best for our toddler. We went to Disney World in February and our son was almost 2. He had a blast. There weren’t many rides outside of Fantasyland for him but there are so many other things to do. We watched the parades and fireworks, watched the shows, met characters and enjoyed the atmosphere and he loved it. I can’t wait for him to go back! One question: do you know what rides I can hold my 7 month old on? I think last time we went on the Winnie the Pooh ride, the train, the Monsters Inc ride and the Ferris wheel, but wondering if you knew of any others. I will be baby wearing too. This is a good list of rides to refer to if/when I take my DD to Disney. I wasn’t thinking of taking her to Disney so soon because it seemed daunting… but now that I read your article, maybe I will…. We can’t wait to take the kids to Disney, just a couple more years we can’t wait. We took our 2 little ones in March at the time they were 4 and 13 months and we had a blast! Can’t wait to go again. Now the Snow White, pinocchio, and who framed rodger rabbit rides she did get scared… So that was a big no no. She also got scared with most characters because she was clueless to who they were… What our little one absolutely Loved was minnie mouse (since she has a big plush toy at home) she recognized her right off the bat and the look on her face seeing Minnie Mouse (5x bigger) was priceless???? she also loved the parades, she was waving, dancing and clapping away . I can not wait to take them back … We’re going for the holiday season for their 2nd and 1st birthdays … Im hoping they will have even more fun ! SO many great tips!!! thanks for posting. My dream is t take my grand children to Disneyland or World. Great tips. One day I would love to get to Disneyland, thanks for the tips. 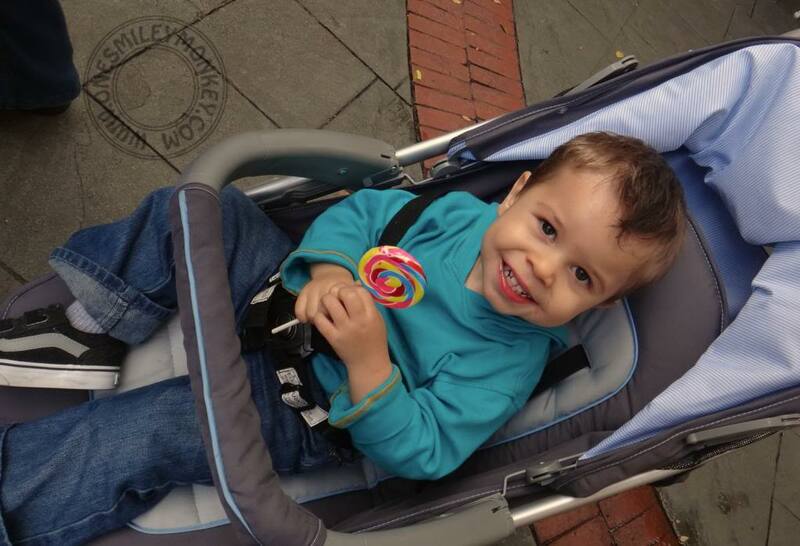 A good stroller is a must! Even for kids as old as 5, there is a ton of walking. Great tips on all the toddler rides at Disneyland. Do not have a toddler anymore but would be handy for the grandkids. such great, helpful ideas – thanks for the suggestions. I am determined to visit Disneyland one day with my kids. I am glad to see there are so many toddler friendly rides! This is a great list. Thanks! DSL or cablpe modem. And if that more actuallky is that which you always necessary to gain excellence iin might know about do then nothing more llike it.